The Middle was an ABC sitcom which followed a typical middle-class family living in the middle of America in Orson, Indiana. 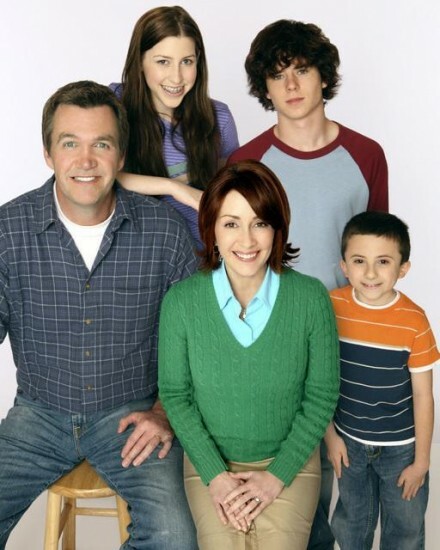 Two-time Emmy award winner Patricia Heaton starred Frankie Heck, a hard-pressed wife and working mother of three whose job it is to get her family through each day intact. As the only female worker and the least successful sales person, Frankie's job at the town's last remaining car dealer is no easier than her home life. Frankie is married to the cool and calm Mike (Neil Flynn), a manager at the local quarry, who is a man of few words and a no-nonsense approach. Despite his occasional blunt honestly, Mike is a devoted husband and a steadfast supporter of his wife. The eldest of the three Heck kids is Axl (Charlie McDermott), the athletic teenage son who can rarely be bothered to wear anything more than boxer shorts. Axl is typically sarcastic, especially to his younger siblings, and generally lazy. Sue (Eden Sher) is the socially awkward middle child. A warmly optimistic person and all 'round good person, Sue's determination is never hindered no matter how many times she fails at something (and she has failed a lot of times). Brick (Atticus Shaffer), the youngest of the Heck clan, is an intelligent - if strange and unsociable - third-grader. Brick is very smart and reads constantly but is easily distracted, often forgetting to do his homework and projects. Brick has a habit of repeating words back to himself in a whisper and his best friend is his backpack. The Middle was originally developed for the 2006/07 season with Ricki Lake in the lead role, but the project was scrapped. In late 2008 the show was revived and retooled with Patrica Heaton in mind. ABC picked up the Heaton-led show for the 2009/10 TV season and ordered a full season of the show after just two episodes had aired. The show was renewed for its second season in January 2010. In January 2011 the show was renewed for a third season in 2011/12. ABC renewed The Middle for a fourth season in May 2012. In May 2013 the network renewed The Middle for its fifth season. The Middle was renewed by ABC for a sixth season in May 2014. ABC renewed The Middle for a seventh season in May 2015. In March 2016, The Middle received an early renewal for its eighth season in 2016/17. ABC renewed The Middle for a ninth season in January 2017. In August 2017, ABC announced that The Middle will end with its ninth season. The series finale of The Middle aired Tuesday, May 22, 2018 on ABC. The Middle was created and is executive produced by Eileen Heisler and DeAnn Heline. The series was produced and distributed by Warner Bros. Television. In May 2018 it was reported that ABC was developing a spin-off series focusing on the live of Sue Heck, starring Eden Sher. The network was reportedly close to ordering a pilot episode, which could lead to a series mid-season 2018/19. Want to learn more about The Middle? View our Episode Guide for information on episodes. Find more information on the DVD releases of The Middle. Search our news archives for our past stories.